Summer is in full swing here! I’ve sent one kiddo off to her absolute favorite summer camp for the ultimate girl’s getaway. Plus, I’ve been shuttling the other two to skateboard camps and summer high school PE courses. We’ve even decided to take on the task of helping our high school-er find his first summer job. Good Gracious! That’s why you’ll find me later with a cocktail in my hand. The house is a constant revolving door of kids and dogs, I’m always schlepping someone to some kind of activity and my kitchen is in constant use. Constant. So the last thing I want to do in summer is slave over the stove. I want light, bright, quick, easy dishes that feel like summer and get me back outside in the garden, by the pool or off to more summer fun. 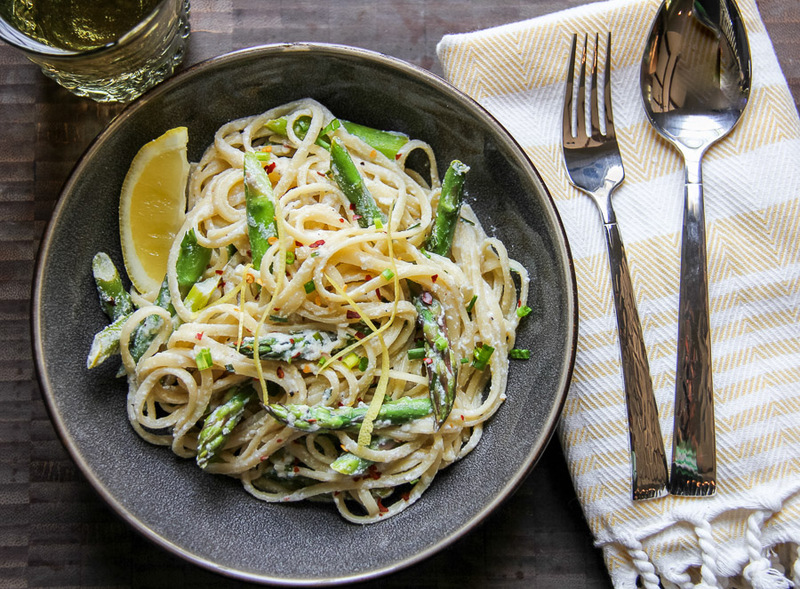 This Lemon Asparagus Linguine is just the right thing. We’ll be sharing all kinds of yummy summer recipes in the next few weeks and on our weekly Facebook Live series. Catch them at noon on Mondays (if you miss them live you can watch them here). Make sure to watch and chat with me while I cook! Grab your favorite pasta. We’re using linguine for our Lemon Asparagus Linguine but if you have or prefer another kind, use it. There’s no way I’m running to the market if I don’t have exactly what I need and neither should you baby! Loosey Goosey is the way my kitchen rolls. Cook it up in salty water and at the last moment throw in your asparagus to blanch. Make sure to save some of the pasta water to make the sauce. The sauce is easily whipped up in your blender with ricotta, lemon zest and juice and little cream. It gets heated up back in the pot the pasta cooked in then tossed with the pasta and asparagus. 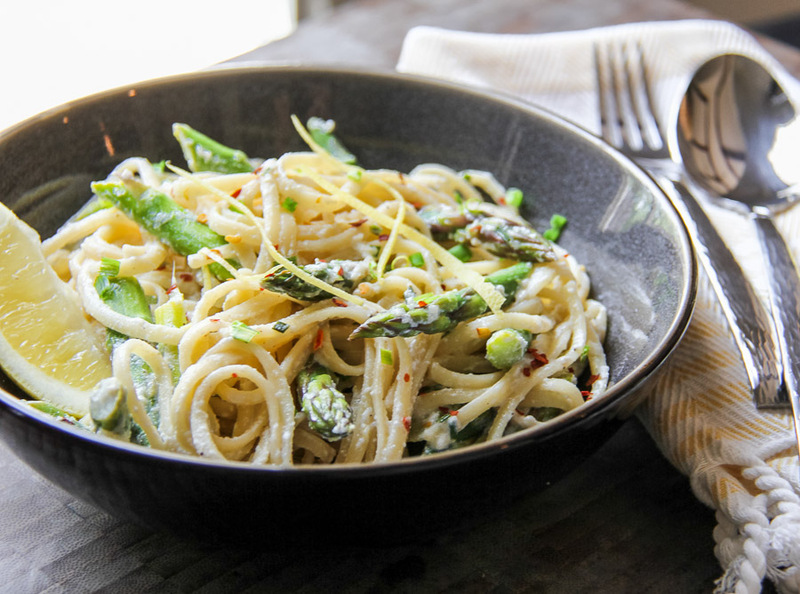 Creamy Lemon Asparagus Linguine. So quick and easy! I love the way the lemon and the asparagus go together and if you wanted to turn this into a main dish (because you’re a super smarty pants) just add some grilled chicken or shrimp. Maybe even something you have laying around as leftovers and reinvent last night’s grill fest! Simple & Easy! 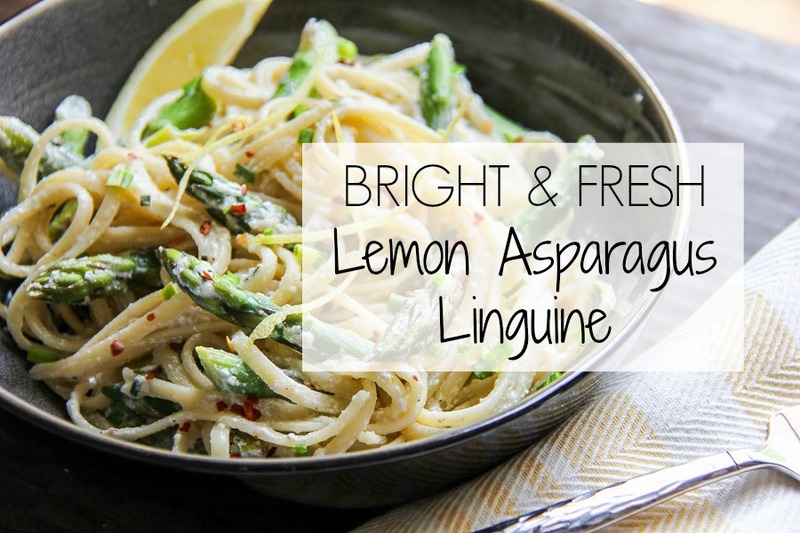 Our Lemon Asparagus Linguine is bright and delicious! Cook pasta according to package directions in salted boiling water. Add asparagus to pot for the last 2 minutes of cooking time. Reserve 1 cup cooking liquid before draining pasta and asparagus. In a blender add 1/2 cup cooking liquid, lemon zest and juice, cream and ricotta. Process until smooth. Heat a large skillet on medium-high heat. Add ricotta mixture to pan; cook 1 minute or until thoroughly heated. Add pasta, asparagus, chives, salt, black pepper and peppers flakes. Add remaining cooking liquid as needed to make mixture creamy. Remove from heat; stir in grated Parmesan cheese. Garnish with extra chives. ** To make this a main course add grilled chicken or shrimp. Pin this recipe and follow Sumptuous Living on Pinterest. We always love to see what you’re pinning too!